50th Anniversary Re-release. Yellow Submarine, based upon a song by John Lennon and Paul McCartney, is a colorful musical spectacle and an exhilaratingly joyful cinematic experience for all ages - filled with visual invention, optical illusions, word play, brimming with peace, love, and hope, propelled by Beatles songs. Want more Beatles? Check out Deconstructing the Birth of the Beatles, July 15, 17 & 18 at the Original. When the film debuted in 1968, it was instantly recognized as a landmark achievement, revolutionizing a genre by integrating the freestyle approach of the era with innovative animation techniques. Inspired by the generation’s new trends in art, the film resides with the dazzling Pop Art styles of Andy Warhol, Martin Sharp, Alan Aldridge and Peter Blake. 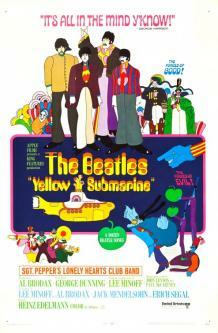 Yellow Submarine is a landmark in animation, with Heinz Edelmann’s inspired art direction conjuring up a non-stop parade of wildly different styles and techniques. From the paper-doll residents of Pepperland, to the tinted photography of the soot covered roofs and smokestacks of Liverpool, the menagerie of fanciful characters in the Sea of Monsters, the kaleidoscopic colour-splashed rotoscoping of Lucy in the Sky with Diamonds, the ertigo inducing pop-art of the Sea of Holes, and the triumphant euphony of the It’s All Too Much finale, the film is simply a joy.